This weekend saw the Falset Wine Festival, we missed it last year so made sure we got to this one. We were pleased to find it was back on the main street of the town like it used to be, the last time we attended the fiesta was up in the castle which left the town virtually deserted. I did not think this was good for either Falset, the cafe’s/restaurants or the vintners as it took people out of town and away from the wine Bodega’s that did not have stands but just opened their doors. Anyway, we decided we would go after Petanca for the early evening when it would be cooler. The first thing we had to do was find somewhere to park as all the car-parks were full to over flowing, but behind the Co-operativa I managed to find a space so I was happy. We entered at the bottom of the main street and found the stands were arranged along the left hand side. People were wandering around with their ‘glass in a bag’ – you bought this for about 20 Euros along with tickets that enabled you to sample the wines – or sitting at tables outside some of the Bodegas. There was also entertainment, I noticed a group of musicians taking a break whilst at the top of the street a ‘human tower’ contest was taking place. There were several visiting teams which included young and old alike but this was the winning team. We then went for a drink bumping into one or two people we know in the process. After a beer we decided to wander around to the main square which is hidden in the heart of Falset. Here we found the cheese stalls, passing small artisan shops selling coffee as well as the delicatessen wines, cheeses, cakes and breads on our way there. Whilst in the square I found some really nice goats cheese so cholesterol is ok for a while. As you can see from the first photographs it was a packed street with people wandering around tasting wines or just standing discussing them, but I did manage to get fairly close to the stand of the Capçanes Celler, it is here they make the wine for the Jewish Church in Cataluña. I could see they were busy as there was quite a crush there. But we did manage to get to the El Masroig stand to be greeted warmly and discovered they have re-branded, and produced a very light Roseada for the UK market. 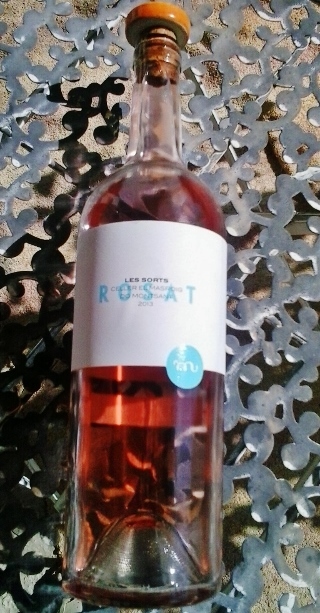 I bought a bottle of their new young red and the Roseada to try at home as it was almost impossible to do so there. But I have made an appointment to visit and find out more about these wines. So to the New Roseada. As I was informed this has been made for the UK market and the Celler was asked to make it lighter in colour as the deep pink we have here was not to the taste of the customers for that market. The result is a very drinkable wine almost a white with a pink blush which is perfect either cold or at room temperature, the Celler has this one spot on. The red is a young wine and meant to be drunk young, this is not for laying down. I found it to be pleasant and very drinkable and one for my shopping list. So I shall be going into more detail about these and the other wines from El Masroig when I visit.